What a good looking classic! All Star Picks 'Vette over Colorado ZR2 - Which Would You Pick? That's not even a choice. Truck #1. Still has warranty. That would be my pick. You should be fine with stock tires. Just run 4 wheel auto. Was looking at a 1/2 ton towable 5th wheel camper. I guess they make sliding 5th wheel hitches. The one I was looking at was 1,400 bucks. Think the trailer is a no! I agree. In the winter people in the back freeze and people in front are dying of heat. Look in the forums under seat issues. Hundreds of pages! I have the GM one and love it. 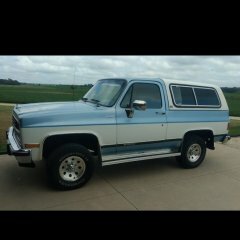 Help truck dropped off lift! Did you get any pic's?